Most of Passion Lilie’s block prints are produced at a block printing studio in Bangalore that is surrounded by trees and a lovely lake that truly inspires creativity. This block printing unit started in 1977 with a mission to preserve block printing in a holistic environment, with ethical labour practices and eco-friendly dyes. The artisans are paid a well-above average salary as well as overtime, paid vacation, sick leave, loans and government holidays as needed. The manager of the block printing unit, Padmini, recognizes that “unless we pay fair wages it is no possible for the artisans to sustain and support their families.” Padmini is an extremely carrying woman who puts the needs of her workers first and treats them like family. Their senior staff has been with the studio for over three decades. Padmini partnered with the State Government Women's Welfare Board to provide free training to underprivileged women. Banu, their expert color mixer, was hired through this program almost 24 years ago. She had no education and was a homemaker. Today she mentors others on the team and handles production coordination. The youngest printer, Satish, joined the team as an apprentice about 8 years ago. He had not completed schooling and was not skilled in any trade. His father was a carpenter earning a meager income. After being mentored by the senior printer, Satish is now a master printer. He supports his parents, owns a nice motorbike and is proud of his earnings. This block printing studio prides themselves on living up to the highest level of eco-friendly standards while creating a beautiful product that does not bleed or fade when washed. 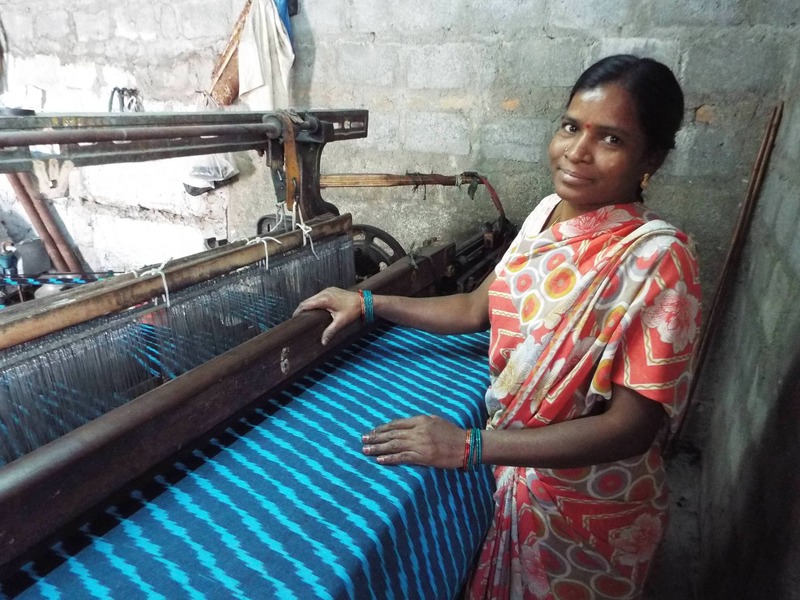 Passion Lilie also uses many handwoven and ikat dyed fabrics that are purchased from several families that live in villages outside of Hyderabad. We work to create ethical and sustainable manufacturing processes that are beneficial for every stakeholder in the supply chain. Passion Lilie works with one head weaver who gives the processing orders to all the families. The families live in simple homes with one room for looms and another room for living. Each home typically has between 1-3 looms with both power and handlooms. The families usually consist of a husband and wife and sometimes 1-2 children. It’s important to note that the children do not work to produce Passion Lilie garments and if the wife does the weaving, she gets the money in her own bank account. The weavers, especially those who work hard, earn a very good wage. In fact, one elderly weaver in our producer group has been able to financially help his son who moved to the city to earn an education and follow his dream. We believe that by lifting up individuals in their own communities, those individuals will help others just as this elderly weaver did. When making fabrics using the ikat dyeing process, the thinner the fabric the longer it takes to weave. This puts a premium on thin fabrics, making them more expensive to produce. Because of our ethical and fair trade practices, the weavers get an advance for this type of work. Then, the final payment for their work is given once the work is completed and they even get a loan if they need one. Ikat weaving has made a major come back in recent years. Thanks to many foreign companies like Passion Lilie, we are able to keep this tradition alive.